Zealdeal Media Limited is committed to protecting the privacy of your personal data in accordance with applicable privacy and data protection laws while providing you with an enjoyable service. 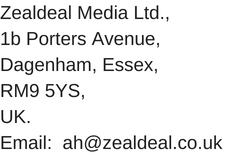 The term "we", "us" or "our" in this Privacy Notice refers to Zealdeal Media Limited and any of its affiliate companies, collectively "Zealdeal"). This Policy applies to information we collect when you use our websites, software, apps and other online products and services where this Policy is posted (collectively, the "Website" or "Websites").